We train twice a week and have junior and adult members. Tuesday's at Wright Robinson College from 7pm - 8pm. Sunday's at Medlock Leisure, Droylsden from 4pm - 5:30pm. If you would like to have a go or just learn more contact us to arrange the loan of the equipment and guarantee availability of intructors, or feel free to turn up. Many of our players compete as part of the successful Manchester Team, which trains every Thursday at the Manchester Aquatics Centre. Our Junior club is for swimmers age 8 and above and for competitions we enter teams in Under-12, U-14, U-16 and U-18's. This is one of the few sports were both sexes, young and old can compete on a very level basis. Thanks for looking, go on give it a go, you never know you might like it. As if that wasn't enough, your first session is free! 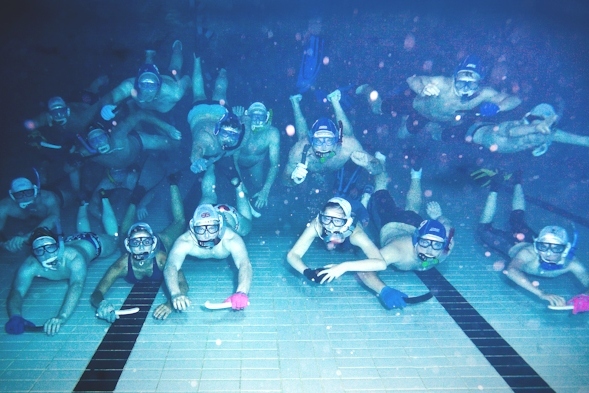 If you would like more info on the unusual sport of Underwater Hockey, please check out the 'What is UWH?' page and other links.